Gotta Make the RELAY–Review and Giveaway! Hi there! I’m continuing my Sports Romance theme this week with a brand new M/M contemporary romance from a new-to-me author, Layla Reyne. 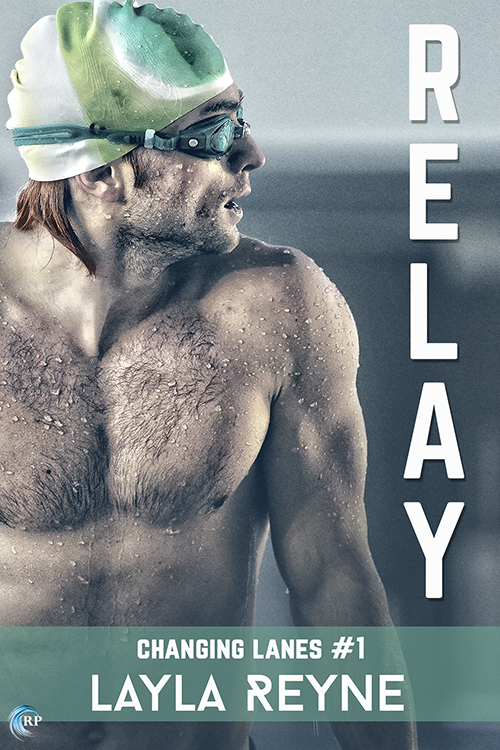 RELAY features the big strapping lads of the US Olympic swim team, and all the drama they suffer to win the gold. It’s the first book in the Changing Lanes series, and looks like we’ll be getting a new couple with each installment. If you like books about competitive swimmers, you might also enjoy WATER MUSIC or DISTANT SWIMMER. You can drop down and catch my review and find the giveaway link for a chance to win a signed copy of RELAY and a $25 GC. Dane Ellis and Alex Cantu were teammates, roommates, and lovers one summer ten years ago, but being gay isn’t something that Dane’s controlling parents will accept, or understand. His father, a powerful televangelist, and his mother, a Home Shopping diva, have ensured that the money Dane earns from sponsors goes into a trust fund he can’t access until he’s thirty, four years from now. Though he’s now 26, they control his life, and he’s not that happy with the results. Dane may be the fastest freestyle swimmer in the country, but he’s socially isolated and a pariah on his team, mainly due to his grandstanding parents. But, also, Alex still harbors the hurt over their teen love lost. And, the other guys on the team really look up to Alex, who is their captain. Alex has had to fight and work for all he’s earned his whole life. His parents own a small farm, and he spent years pitching in, and caring for his younger siblings. To him, Dane had a charmed life with plenty of money and no qualms about leaving him behind. As captain, he has some say in which swimmers make the relay teams. And, he doesn’t want Dane on the medley with him. This is a four-man team where each one swims a different stroke: backstroke, fly, breaststroke and freestyle. Alex is the reigning gold medalist in backstroke, and he selects another swimmer, Dane’s teammate and mentor, to swim the freestyle part of the relay. It breaks Dane’s heart, and enrages his parents. It also leads to strife on the team. The more time they spend together training, however, the more Alex sees that Dane isn’t the arrogant jerk he’d built up in his mind since their forbidden summer. Dane is vulnerable, and tired of his parents stomping all over his life. Seeing the out and proud members of his team being real, Dane decides he’s had enough of the facade, and it leads to a truce with Alex–and a lot more, including acceptance from his teammates for the first time in…ever. But his parents aren’t above blackmailing Dane to get him to fall into their line yet again. When Alex is accused of doping, Dane is sure his folks are the guilty parties. It’s up to his newly-gelling team, and Dane’s particular expertise, to clear Alex’s name. I really liked this one. There’s a good mix of athleticism, anger and acceptance, including love. Dane’s life isn’t pleasant, and seeing him take the necessary steps to find his own happiness is engaging. Alex is a bit of a jerk, and I understood why–watching him get over his busted heart was nice. I liked his family, and how loving they were. And I liked how his mom, who is struggling with breast cancer treatment, made sure Alex knew that he didn’t need to break his back for everyone besides himself. Expect a lot of drama; these guys are really high stakes competitors, and have tempers to match. It seems as if the next book will take us to the Olympics, and feature a new couple on the team…which is interesting. I’m looking forward to it! Interested? You can find RELAY on Goodreads, Riptide books, Amazon, Barnes & Noble, iTunes and Kobo. Click on this link to comment on my pal Joyfully Jay’s giveaway post. One tour commenter will win a singed copy of RELAY and a $25 Amazon gift card. Catch up with Layla Reyne on her website, Facebook, twitter, Tumblr, Pinterest, Goodreads, or sign up for her newsletter.